* I am certainly no fan of Erick Erickson. He has proven himself to be one nasty SOB. But that’s what makes his latest column so interesting. The predicate act to Bill Clinton’s impeachment was his affair with an intern and his lying to cover it up. Republicans said the President of the United States is not above the law and lying under oath to obstruct justice is an impeachable offense. Republicans owe Bill Clinton an apology for impeaching him over lies and affairs while now embracing a pathological liar and womanizer. * Charles Pierce writes that The Clinton Email Scandal Cannot Die, Because It Is a Clinton Scandal. So CNN came up with an exclusive report that the exhaustive—and exhausting—FBI inquiry into Hillary Rodham Clinton’s handling of her emails, and of the material therein, is reaching its expected end. To the great dismay of both Republican candidates and of what we may call the Salon COINTELPRO wing of progressive politics, the nothingburger will apparently forever lack sizzle. The people who are hungry for more nothingburger have a story that contains both the phrases, “Huma Abedin” and “FBI.” That’s more than enough to keep direct-mail ratfcking enterprises in business…. And, as should have been obvious the last time around, the political potential of the dark Clinton mythology is immune to logic, facts, and empirical reality. * Jared Bernstein says that those who assume the sky is falling because the economy only added 160,000 jobs last month (that’s now 74th straight month of private sector job growth) are probably jumping the gun. In other words, filtering out some statistical noise, we’re growing at trend. Productivity is too low, but the job market is tightening and wage growth is getting a bit of a boost. We certainly want to take note of the weaknesses in the “high-frequency” data, but a month or a quarter does not a new trend make. * Today President Obama announced some additional rules on financial transparency – specifically targeting shell corporations. Following his remarks, a reporter asked him to comment on Trump’s “taco salad” tweet. Here is his response (words are the President’s and the visual is mine). * Recently President Obama chatted with actor Bryan Cranston – who stars in the upcoming HBO movie All the Way about LBJ’s first year in office, during which he passed the Civil Rights Act. One of the more interesting responses came from a question about how the President sees his own legacy. BO: Oh, it’s very hard for me to engage that. PG: You think it would be brag? BO: No, it’s that there’s me, and then there’s this character named “Barack Obama” who is slightly different on Fox News than he is on MSNBC. I wouldn’t vote for the Barack Obama on Fox News probably. BO: What a loser! No, it’s hard to see yourself in that way. The one area that I do feel confident about is the notion of an inclusive nation, that everybody is part of this story. That’s a running theme I’ve been faithful to throughout my presidency. I’ve given a lot of speeches. One of my favorites is one I gave in Selma, and there’s a riff when I talk about what America is. I’m talking about Jackie Robinson and a ranch hand, about an immigrant on the Lower East Side and a bunch of G.I.s landing on the shores of Normandy. I love it because it captures the essential miracle of this country: all these pieces from every corner of the globe. It works in fits and starts. It’s messy, and it’s ugly. There’s sadness and tragedy. Yet something distinctive and full of energy emerges from it. And it captures the imaginations of people all around the world. 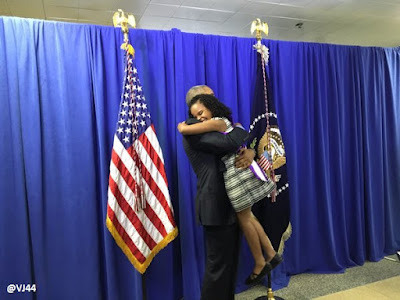 * Finally, while President Obama was in Flint this week, he met Mari Copeny (Little Miss Flint). I think these two community organizers kinda like each other.